The Aero L-39 Albatros is a high-performance jet trainer developed in Czechoslovakia by Aero Vodochody. It was designed during the 1960s as a replacement for the Aero L-29 Delfín as a principal training aircraft. The L-39 Albatros has the distinction of being the first of the second-generation jet trainers to be produced[clarify], as well as being the first trainer aircraft to be equipped with a turbofan powerplant[clarify]. The type was exported to a wide range of countries as a military trainer. In 1964, Czechoslovak aircraft manufacturer Aero Vodochody embarked on a new design project to meet the specified requirements for a "C-39" (C for cvičný – trainer), setting up a design team under the leadership of Jan Vlček. This aircraft was to serve as a replacement for the Aero L-29 Delfín, an early jet-powered trainer, as a principal training aircraft. Vlcek envisioned the type, a twin-seat single-engine aircraft, being adopted as the primary trainer throughout the Warsaw Pact nations. On 4 November 1969, the L-39 (under the designation "Prototype X-02" – the second airframe to be built) conducted its maiden flight, for which it was piloted by Rudolf Duchoň, the factory's test pilot. Serial production of the initial model of the L-39, designated L-39C, commenced in 1971. In 1972, the L-39 Albatros was formally recognized by the majority of the countries comprising the Warsaw Pact as their preferred primary trainer, after which point, sizable orders from military customers throughout the bloc proceeded, many of which were from the Soviet Air Forces. In 1974, the first L-39 trainer entered service with the Czechoslovak Air Force. Several specialised variants of the base L-39 design were quickly introduced. 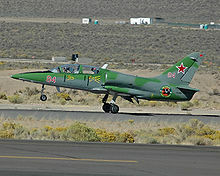 In 1972, a purpose-built target tug variant, the L-39V, conducted its initial flight. In 1975, the first L-39ZO training/light combat model, which was equipped with four underwing hardpoints as well as a strengthened wing and modified landing gear, performed its first flight. In 1977, the first L-39ZA light combat variant, which was fitted with a single Gryazev-Shipunov GSh-23 cannon mounted underneath the fuselage in addition to the four hardpoints and strengthening of the L-39ZO, made its maiden flight. According to aerospace publication Flight International, roughly 200 L-39s were being sold each year upon the jet trainer market during the late 1980s. According to the Stockholm International Peace Research Institute, in 1993, the total export orders gained for the L-39 represented 80 per cent of the value of all Czech military product export sales made for that year. During the 1990s, shortly following the dissolution of the Soviet Union and the end of the Cold War, Aero Vodochody decided to develop versions of the Albatros equipped with Western-sourced avionics, engines, and weapon systems. Around the same time, Aero Vodochody formed an active partnership with Elbit Systems of Israel, under which a number of L-39s were delivered to Elbit to be equipped with modern electronics and onboard systems before being re-exported to end users such as the Royal Thai Air Force. Sales of the L-39 declined during the 1990s. This downturn has been attributed to the loss of the captive Warsaw Pact trainer market, to which a substantial proportion of the total aircraft manufactured had been historically sold to; allegations about Czechoslovak banks being unable to finance the defense industry and inaction on the part of the Czechoslovak government; and concerns over the quality of manufacturing standards. In 1996, production of the L-39 came to an end. Since the end of production, Aero Vodochody has developed several improved variants of the L-39 to take its place, and has continued extensive support and overhaul operations for existing L-39 customers. 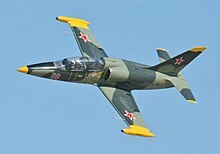 One of the replacements for the L-39 Albatros was the Aero L-159 Alca, a modernised version of the L-39. Originally, Aero Vodochody had intended to develop the L-159 in partnership with Elbit, but the Czech Ministry of Defense instead selected Rockwell Collins to partner on the program. The limited success of the L-159 led Aero to announce at the 2014 Farnborough Airshow that it was developing an upgraded version of the L-39, designated L-39NG, to compete with the Alenia Aermacchi M-346 and British Aerospace Hawk. The L-39NG replaces the AI-25 turbofan with a Williams FJ44 engine; the airframe is modified, the wingtip fuel tanks being eliminated, and a new suite of avionics will be provided. First flight of the L-39NG was in September 2015, with deliveries starting in 2020. The L-39 Albatros was designed to be a cost-effective jet-powered trainer aircraft, which is also capable of performing ground attack missions. For operational flexibility, simplicity, and affordability, the majority of onboard systems have been simplified to avoid incurring high levels of maintenance, as well as to minimize damage caused by mishandling when flown by inexperienced air crew. It could be readily flown from austere airstrips such as frozen lakebeds, enabled through the rugged design of the landing gear and favourable low landing speeds. The aircraft's flying qualities are reportedly simple, which is made easier by way of a rapid throttle response, making it easier for students who had never previously flown a jet aircraft before to successfully control. As a training platform, the L-39 itself comprised part of a comprehensive system which also used flight simulators and mobile ground test equipment. Iraq became the first export customer for the L-39 Albatros. By mid 1970, the Iraqi Air Force had procured a considerable number of L-39 trainers, having transferred the bulk of their training activities onto the Czechoslovak aircraft. During the American-led invasion of Iraq in 2003, on 14 April 2003, a pair of United States Navy McDonnell Douglas F/A-18 Hornets attacked several L-29 and L-39 aircraft on the ground at an airfield near the city of Tikrit; these had been believed to have been modified to perform as delivery platforms for weapons. In the midst of that conflict, on April 21, 1983, three LARAF Ilyushin Il-76TDs and one Lockheed C-130 Hercules landed at Manaus Airport, Brazil after one of the Il-76s developed technical problems while crossing the Atlantic Ocean. The aircraft were then searched by the Brazilian authorities: instead of medical supplies – as quoted in the transport documentation – the crate of the first of 17 L-39s bound for Nicaragua together with arms and parachutes, to support the country's war against US-backed Contras, were found. The cargo was impounded for some time before being returned to Libya, while the transports were permitted to return to their country. During the 1990s and 2000s, Libya made multiple attempts to get components and services for its air force in spite of an embargo placed upon the country by United Nations Security Council Resolution 748; by 2001, only half of Libya's L-39s were serviceable as a consequence. According to Reuters, by 2014 the L-39 had allegedly become one of the favoured platforms of the Syrian Air Force for performing ground attack missions due to its slower speed and higher agility over other aircraft in its inventory. In December 2015, following the securing of the Kweiris airbase by government forces, the resumption of ground-attack missions by L-39s in the vicinity of Aleppo commenced shortly thereafter. On 26 December 2017, a Syrian L-39 was shot down near Hama airport. 230107 – L-39C on static display at the National Technical Museum in Prague. 230108 – L-39C on static display at Caslav Air Base in Čáslav, Central Bohemia. 931531 – L-39C as 01 Blue on static display at the Lithuanian Aviation Museum in S. Darius and S. Girėnas Airport (EYKS) Kaunas. 430405 – L-39C on static display at the Southern Museum of Flight in Birmingham, Alabama. 533526 – L-39C on static display at the Hiller Aviation Museum in San Carlos, California. 131907 – L-39C on static display at the Teton Aviation Center in Driggs, Idaho. ^ a b c Wilkinson 2002, p. 30. ^ John Pike. "Aero L-39 Albatros". Globalsecurity.org. Retrieved 2013-03-15. ^ a b c d e f g h i "L-39 Program." Archived 2016-04-18 at the Wayback Machine Aero Vodochody, Retrieved: 17 April 2016. ^ Jackson, Robert (2011). Aircraft from 1914 to the present day. p. 174. ISBN 978-1-907446-02-3. ^ Lake 2000, pp. 117–118. ^ a b Lake 2000, p.122. ^ a b c "Aero L-39 Albatros." Flight International, 18 November 1978. p. 1872. ^ "Military Aircraft Directory: Aero Vodochody." Flight International, 29 July 1998. ^ "Czechoslovakia: Aero L-39 Albatros." Flight International, 4 July 1981. p. 26. ^ a b c Jeriorski, Andrzej. "Business Analysis: Dilemmas in Prague." Flight International, 5 April 1994. ^ Kiss 1997, p. 46. ^ a b Kiss 1997, p. 48. ^ Karp 1993, p. 117. ^ "IAI targets L-39 users for electronics upgrade." Flight International, 18 June 2003. ^ Sedlak, Lubomir. "Aero Vodochody up for sale." Flight International, 17 May 2005. ^ Gerzanics, Michael. "Czech striker." Flight International, 13 October 1999. ^ Kiss 1997, pp. 48-49. ^ "Aero L-39 Albatros Advanced Trainer / Light Attack Aircraft - Czechoslovakia". MilitaryFactory. 3 January 2018. ^ Wilkinson 2005, pp. 164–166. ^ Wilkinson 2005, pp. 165–166, 169. ^ a b c d e f g h Taylor 1988, pp. 47–48. ^ a b Wilkinson 2005, p. 165. ^ a b c Wilkinson 2005, p. 164. ^ Wilkinson 2005, p. 166. ^ a b Wilkinson 2005, p. 168. ^ a b "Warlike Jets." Flight International, 2 July 1983. p. 28. ^ Wilkinson 2005, p. 169. ^ a b Lake 2000, pp.123–124. ^ Lake 2000, pp. 125–126. ^ "The Georgian Times on the Web". Geotimes.ge. Archived from the original on 2012-01-18. Retrieved 2011-12-29. ^ Cooper, Tom; Troung; Koelich, Marc (10 February 2008). "Afghanistan, 1979–2001; Part 2". ACIG. Retrieved 23 December 2014. ^ "Taliban's modest armoury." Flight International, 16 October 2001. ^ Starkey, Jerome. "Karzai escapes again as Taliban attack parade." The Independent, 27 April 2008. ^ "Afghan AAF Training Getting Its Own Air Traffic Control." Defense Industry Daily, 29 January 2012. ^ "Air War over Nagorniy-Kharabakh, 1988–1994". Acig.org. Retrieved 2011-12-29. ^ Velinger, Jan. "Třinecké železárny win lucrative contract worth 15 billion crowns." Třinecké železárny win lucrative contract worth 15 billion crowns, 24 September 2015. ^ Seely 2001, p. 121. ^ "Chechenya – Air force in local wars". Retrieved 4 October 2014. ^ Corrigan 2016, p. 64. ^ Holmes 2012, p. 66. ^ "Libya". Lcweb2.loc.gov. Retrieved 2013-03-29. ^ "Libyan Wars, 1980–1989, Part 6". Acig.org. Retrieved 2013-03-29. ^ Cooper, Tom (1 September 2003). "Central and Latin America Database: Nicaragua 1980–1988". Air Combat Information Group. Retrieved 4 May 2011. ^ "Brazil Holding Arms for Nicarague". Google News Archive. The Hour. 22 April 1983. p. 12. ^ "Italy thwarts Libyan move." Flight International, 4 September 2001. ^ Wilkinson 2005, p. 162. ^ Butowski, Piotr (1 May 2002). "Russian military trainer strategy falls into place; the selection of the Yak-130 marks an important step towards replacing the country's aging fleet of L-39Cs. Things are moving in the simulator business, too". Interavia Business & Technology. Aerospace Media Publishing. ISSN 1423-3215. Archived from the original on 24 September 2015. Retrieved 22 August 2015 – via HighBeam Research. (Subscription required (help)). ^ Collins, Peter. "FLIGHT TEST: Yak-130 proves versatility." Flight International, 10 July 2012. ^ "Syrian government using L-39 trainer jets to attack rebels — Air Cache". Air.blastmagazine.com. 2012-08-09. Archived from the original on 2013-05-13. Retrieved 2012-09-29. ^ "24 7 Aleppo أوغاريت حلب , هااااااااااااااااااام جدا , لحظة سقوط الصاروخ من طائرة الميغ". YouTube. Retrieved 2012-09-29. ^ Boxx, Eddie. and Jeffrey White. "Policy Analysis: Responding to Assad's Use of Airpower in Syria." The Washington Institute, 20 November 2012. ^ "Amateur footage emerges of Syrian jets deployed against rebels." The Telegraph, 25 July 2012. ^ a b "As flights resume out of Kweiris, rebel commander expects raids to increase." Syria Direct, 16 December 2015. ^ "Syria – FSA Capture Al-Jarrah Military Air Port (Feb 2013)". YouTube. 12 February 2013. ^ Roggio, Bill. "‘Islamist factions’ seize Syrian airbase." The Long War Journal, 12 February 2013. ^ Zion, Ilan Ben. "Islamist rebel air force takes off in Syria." Times of Israel, 3 November 2013. ^ Majumdar, Dave. "U.S. Fighter Jocks Pray The ‘ISIS Air Force’ Rumors Are True." The Daily Beast, 21 October 2014. ^ Yashar, Ari. "Syria Bombs Islamic State 'Air Force'." Israel National News, 22 October 2014. ^ "Syrian media confirm opposition shot down regime military aircraft near the eastern Hama countryside." Al Arabiya English, 26 December 2017. ^ "L-39 aircraft was reportedly shot down after taking off the Hama airport." syria.liveuamap.com, 26 December 2017. ^ Wilkinson 2002, pp. 32–33. ^ "Jet Class." Archived 2016-04-18 at the Wayback Machine National Championship Air Races, Retrieved: 17 April 2016. ^ "Jets." Archived 2016-04-15 at the Wayback Machine Racing Jets Incorporated, Retrieved: 17 April 2016. ^ Hoffman, Carl. "Reno Enters the Jet Age." Air & Space Magazine, September 2002. ^ Federal Aviation Administration (30 September 2012). "Make / Model Inquiry Results". Retrieved 30 September 2012. ^ Transport Canada (30 September 2012). "Canadian Civil Aircraft Register". Archived from the original on 18 July 2011. Retrieved 30 September 2012. ^ "Black Diamond Jet Team Performance". blackdiamondjetteam.com. Archived from the original on 2013-01-18. Retrieved 2012-07-12. ^ Siminski, Jacek. "Stunning Air-to-Air photographs of the Latvian Baltic Bees Aerobatic Display Team." The Aviationist, 11 December 2015. 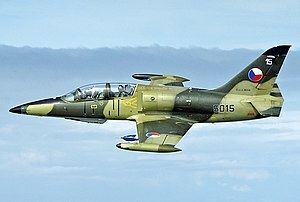 ^ "Aero L-39 Albatros – Ground Attack Aircraft, Surveillance-Jet and East-Block Jet Trainer: MiGFlug.com". MiGFlug – Jet Fighter Flights in Supersonic Military Fighter Aircraft. Retrieved 7 December 2015. ^ "L-39 Flights Above the Californian Desert." flyfighterjet.com, Retrieved: 17 April 2016. ^ "Fighter Jet Flights in the US, Russia & Europe." flyajet.com, Retrieved: 17 April 2016. ^ "L-39 squadron Russ based in Vyazma – Official Website of Rus' L-39 Squadron / Flight School based at Vyazemskiy Aviacenter, Vyazma / Vjazma, Smolensk, Russia – Welcome – History of the Squadron". Vyazmarus.com. Archived from the original on 2012-02-27. Retrieved 2011-12-29. ^ a b c "L-39 Civil Program." Archived 2014-05-21 at the Wayback Machine Aero Vodochody, Retrieved: 17 April 2016. ^ "Air Mod List - Civil Aviation Authority of New Zealand". www.caa.govt.nz. Retrieved 3 December 2018. ^ "Issue 09/10". Defpol.org.ua. 2011-09-13. Retrieved 2011-12-29. ^ "Czechoslovakia: Aero L-39 Albatros." Flight International, 21 August 1990. p. 36. ^ Vrublová, Tereza. "Aero Vodochody introduces the L-39NG: the next generation of the legendary jet trainer". L-39NG Next Generation. Aero Vodochody. Retrieved 4 September 2014. ^ Nigel Hitchman (June 2016). "Aero Friedrichshafen". Air-Britain Aviation World. Vol. 68 no. 2. Air-Britain. ISSN 1742-996X. ^ a b c d e f g h i j k l m n o p q r s t u v w x y z aa ab ac Jennings, Gareth (12 October 2018). "Aero rolls out first L-39NG". IHS Jane's 360. London. Archived from the original on 2018-10-12. Retrieved 12 October 2018. ^ "Flying Flying – Scramble". scramble.nl. Retrieved 19 May 2015. ^ "Fuga din tara a elevului pilot Mihai Smighelschi cu avionul L-39 Albatros". Pilotmagazin.ro. 22 April 2011. Archived from the original on 25 October 2011. Retrieved 29 December 2011. ^ "Atlas Air CEO Chowdry killed in crash. (Michael A. Chowdry killed in jet trainer crash)(Brief Article)". Air Transport World. Archived from the original on 2008-08-01. ^ National Transportation Safety Board (2002). "NTSB Identification: DEN01FA044". Archived from the original on 24 April 2016. Retrieved 1 January 2015. ^ "Red Bull Pilot Killed In L-39 Crash". avweb.com. Retrieved 7 December 2015. ^ "Airframe Dossier – Aero L-39C Albatros, s/n 0107 CEF, c/n 230107". Aerial Visuals. AerialVisuals.ca. Retrieved 20 March 2017. ^ "Airframe Dossier – Aero L-39C Albatros, s/n 0108 CEF, c/n 230108". Aerial Visuals. AerialVisuals.ca. Retrieved 20 March 2017. ^ www.itmarks.lt. "News » Lietuvos aviacijos muziejus". www.lam.lt. Retrieved 3 December 2018. ^ "Aviation Photo #2294683: Aero L-39C Albatros - Lithuania - Air Force". Airliners.net. Retrieved 3 December 2018. ^ "Airframe Dossier - AeroL-39, c/n 430405, c/r N82497". Aerial Visuals. AerialVisuals.ca. Retrieved 20 March 2017. ^ "L-39C "Albatross"". Hiller Aviation Museum. Hiller Aviation Museum. Retrieved 18 March 2017. ^ "Airframe Dossier – Aero L-39C Albatros, s/n 68 red PSU, c/n 533526, c/r N139AF". Aerial Visuals. AerialVisuals.ca. Retrieved 20 March 2017. ^ Henniger, Mike. "Aerial Visuals - Airframe Dossier - Aero L-39C Albatros, c/n 131907, c/r N439RS". aerialvisuals.ca. Retrieved 2017-08-25. This page was last edited on 5 April 2019, at 10:30 (UTC).